Don't worry if your phone plan doesn't include international calling, you don't have to call the North Pole to get in touch with Santa. You just have to fill out this form from the St. Johns County website. Parents in St. Johns County that have children under 8-years-old can have Santa Claus call their kid(s) this holiday season. Don't worry if your phone plan doesn't include international calling, you don't have to call the North Pole to get in touch with Santa. St. Johns County officials and elves are working hand in hand to make Santa available St. Johns residents. You just have to fill out this form from the St. Johns County website. 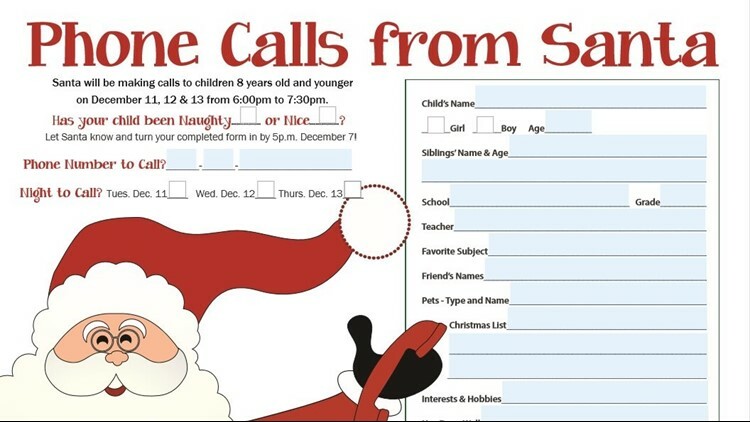 Despite being so busy, Santa has set aside December 11, 12, and 13 from 6 p.m. to 7:30 p.m for phone calls. For a call, simply fill out the form and drop it off at the St. Johns County parks and rec department or fill it out online and hit 'send' in the bottom of the page. You have to sign up by Friday, December 7 in order for Santa to fit your child into the schedule. For more information, contact Ashley Brown at 904-209-0321 or abrown@sjcfl.us.